TubBuddy is an ergonomic Bathing Transfer System designed to allow patients to safely transfer over a bath tub. The TubBudy is also capable of rolling over standard/elongated toilets to be used as a commode. The TubBuddy eliminates unnecessary transfers between toileting and bathing making it comfortable for both patient and caregiver meanwhile reducing costs and contributing to good patient hygiene. Tub Buddy Transfer System is manufactured by ShowerBuddy using the latest technology in Bathroom Assist devices. It is an ergonomic Bath Tub Transfer system designed and engineered in New Zealand. The TubBuddy Transfer system is designed to alleviate heavy lifting and unnecessary transfers. This unique system allows for Patient Transfer from the toilet to tub or shower in one easy trip, utilizing only one transfer while maintaining the privacy and dignity of the patient. The ShowerBuddy SB2 has important safety features like lap and chest belts, 5" locking castors, and removable, foldaway arms. This complete transfer system also eliminates slip hazards and it has a 300 lb. weight capacity. The SB2 is designed for comfort too. It's Height adjustable with an Adjustable neck rest and a Footrest. It will roll over a standard or elongated toilet and is easily assembled-without any additional tools. The TubBuddy is not just another wheelchair. 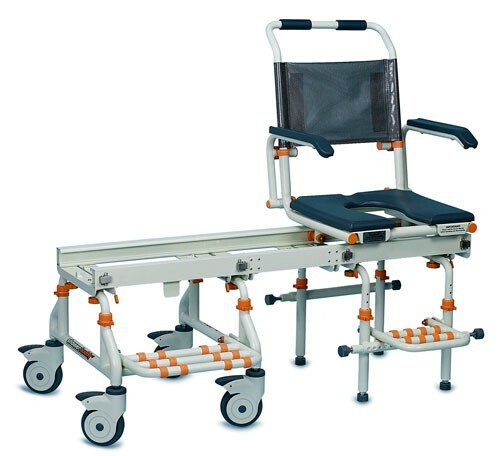 With it's built in commode, caregivers or users can easily transport individuals into the bathroom or Tub. It's lightweight and water & rust resistant components makes it one of the most convenient and versatile wheelchairs on the market. Another product option is the Tilt TubBuddy featured in the photo above right. The tilt version allows for safe and easy transfer over and out of the bath tub incorporating a tilt option. The tilt option allows the caregiver to relieve pressure for the patient while simultaneously making it easier to bathe the patient. The tilt feature alleviates caregiver strain by allowing the patient to slide over the bath tub without having to lift their legs. High weight capacity of 300 pounds. Tapered cushion with tailbone recess. Rolls over standard or elongated toilets. Removable, lockable, and foldaway arms. Height adjustable to accommodate a greater range of patients. Full aluminum frame (Grade 6061 T6). Stainless steel hardware (Grade 304). Fold up footrest on rolling and bath base. Lap and chest belts for greater safety. 5” locking castors for easier rolling over obstacles. Can the Tub Buddy system be used facing either direction ? The tub buddy system can be situated in either direction. SB2T does it come (or able to buy separately) with a "splash guard"? Splash guards are not included; however, we do sell a number of splash guards that may be compatible with this item. Well i was afraid to buy this product because if it dont fit...gulp! ha But it just fits in there and my father enjoyed a shower after 6 months of bed bath. He is a stroke victim, completely disabled, but felt safe in this chair. it is pretty generous size and once we got it set up , its been a real blessing to see him enjoy this and good for me too as i can roll hin there and get him bathed fairly easily...i hope that it lasts for a very long time. i gave 4 stars because it is expensive..or it would have 5. Surprisingly, this system is very easy to use. When I first saw it, I thought I would never learn how to use it to transfer our patients. But I was wrong. After carefully watching some videos and reading the manual, I practiced just one time and I mastered it already! For years, helping grandpa with his shower was a big burden for my family. Since he got surgery and was restricted to move freely, he always needed some help to wash himself but it wasn't easy for both him and the rest of the family. It even sometimes caused us to have fights. With shower buddy, the procedure got much more convenient and shorter. It really is easier to use than it seems. The ShowerBuddy Transfer System for Standard Shower is an easy way to give a bath to an elderly patient. It helps a bedridden person who needs to be cleaned many times to get a clean bath easily. It helped me a lot. It was a real lifesaver and saved a lot of money. Easy to use and transport. Great price! !